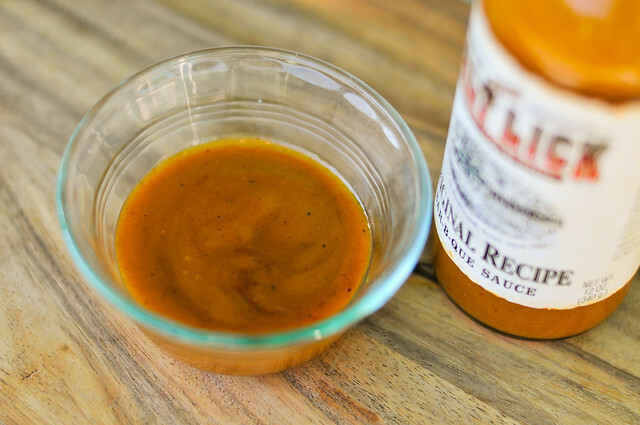 The Salt Lick Original Recipe Bar-B-Que Sauce has an incredible balance of flavors between mustard, vinegar, sugar, and a little spice out of the jar--the best mustard sauce I've tried so far. Just beware that all that greatness can get lost when used as a baste over the high heat of the grill. Before I headed across the barbecue trail in the Lone Star State, the Salt Lick was what I always thought of when I thought of Texas barbecue—they're arguably the most recognizable name from Texas. The Salt Lick—named actual salt licks used by local wildlife on the property—got started in 1967 when Thurman Roberts, Sr. and Hisako Roberts opened their restaurant, cooking meats in the way of their pioneering parents who helped settle Driftwood nearly 100 years before. The love and care that went into their barbecue was not lost on the locals, who helped grow the business into what it is today. 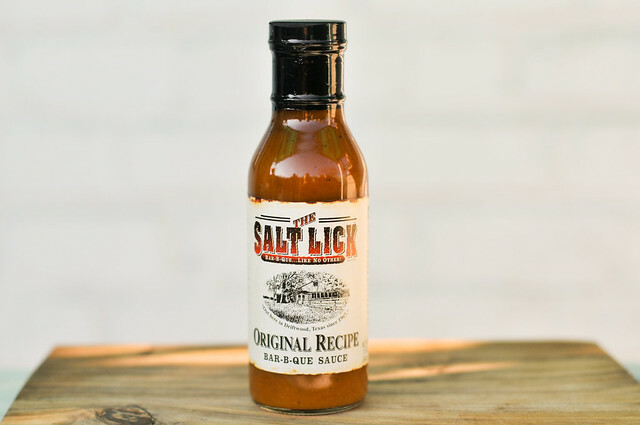 Run by Scott Roberts, The Salt Lick now has three locations and does a mail order business where you can get their sauces and rubs as well as merchandise and even their famous barbecue. The first smell is of a complex and vibrant mustard. Mustard is the dominant trait and it has a nice tartness and spice that gives a little singe to the nose. There's a faint sweetness too in this well balanced sauce. There are a lot of visible spices seen in this smooth sauce that's the color of a dirty yellow mustard. You can distinctly make out specs of black and red pepper through the light hue. This sauce runs medium-thin, creating a smooth, continuous pour off a suspended spoon. This is the first mustard sauce I've tried that I really loved. 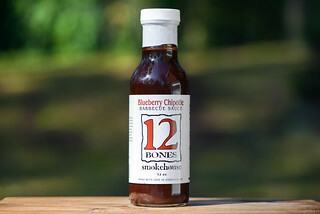 The flavor is balanced and smooth, with a lot of different elements coming together to form a seamless barbecue sauce. Mustard is the most prevalent ingredient, but it's sharpness is tempered with just the right amount of sugar. The tartness of the mustard is amped up a bit with vinegar, but not so much that it over takes the sweetness. The complex worcestershire is responsible for the depth of the sauce, and after all those flavors settle on the tongue, the peppers show up right at the end with a very mild heat. Being pretty crazy about the sauce out of the jar, it was a shock to be disappointed with it after being cooked. First, the sauce did not back in well, requiring extra coatings to make sure the chicken had enough for a proper taste test. Then those final coats ended up burning over direct high heat, leaving the chicken too blackened for my taste. The flavor also mellowed after being grilled, which was a shame, because that meant the most prominent flavor was the burnt parts of the chicken—not good eats. 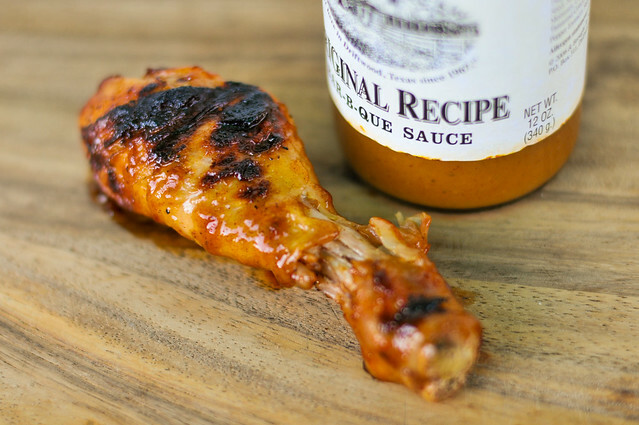 Not all sauces are made for all purposes, and The Salt Lick Original Recipe Bar-B-Que Sauce is a perfect example of that. Out of the jar it's the best mustard sauce I've tried so far. 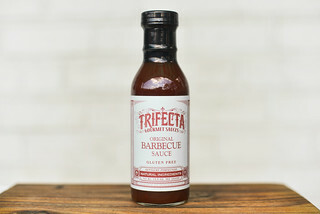 I strongly recommend it as a dip or condiment, where it's balanced flavors will do wonders smothered on pork chops or barbecued beef. At the same time, it did not hold up over the high heat of the grill, losing some of its flavor and burning too quickly. 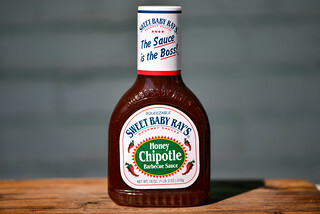 In my opinion, the pros well outweighed the cons, making this a top contender in the growing field of sauces tested. The first time I had their sauce I loved it. The second time I started to wonder if it was really just honey mustard with a little dry rub. The third (and subsequent) times I wished I had more of their grilling mop rather than the sauce. Maybe this is all because the first trip was to Driftwood and the others were to either Round Rock or the airport. I have a bottle of this bad boy. What do you suggest making with it? The thing about Texas BBQ is that the sauce is strictly for dipping. True Story: I brought home a bunch of Salt Lick to the family in Ohio. I was asleep after the long road trip, but I awoke to a sweet smell wafting in the air. My mother took all that meat, and the bottle of dipping sauce and had it all boiling in a pot. They had no idea.. how could they. Ohians.